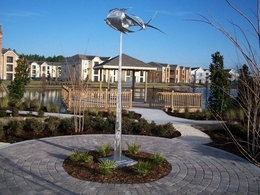 Designed with a modernized arts and craft style, all residential buildings surround a pristine three-acre lake featuring walkways, lighted fountains, and professional landscaping. Dramatic archways invite you inside your apartment home with lofty nine-foot ceilings and a spacious open design. The chef-caliber kitchen makes both entertaining and everyday cooking a pleasure while the personal spaces offer luxurious baths with soaking tubs and generous walk-in closets. The fully appointed 6,300 square foot clubhouse, the "North Beach", features a 24-hour health club with cardio theater and cyber cafe with computers, IPOD docking stations and hardwired data ports. Refresh and renew in the "Award Winning" beach-style resort swimming pool and hydrotherapy spa. Tennis buffs can sharpen their backhand on the lighted tennis court and golfers can test their read on the sloping six-hole putting green. 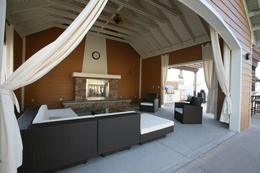 The outdoor fireside lounge, complete with summer kitchen and al fresco dining area, awaits your grilling skills. 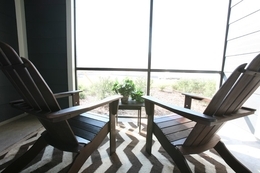 The "North Beach Terrace" offers a quiet place to unwind and reflect. Close your book and watch the colorful sunsets from this getaway setting and let your magical evening begin. 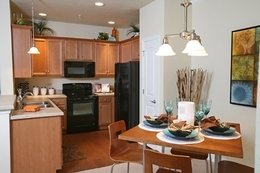 You can have it all at North Beach on Kernan. Lakeside Walkways leading to the "North Beach Terrace"